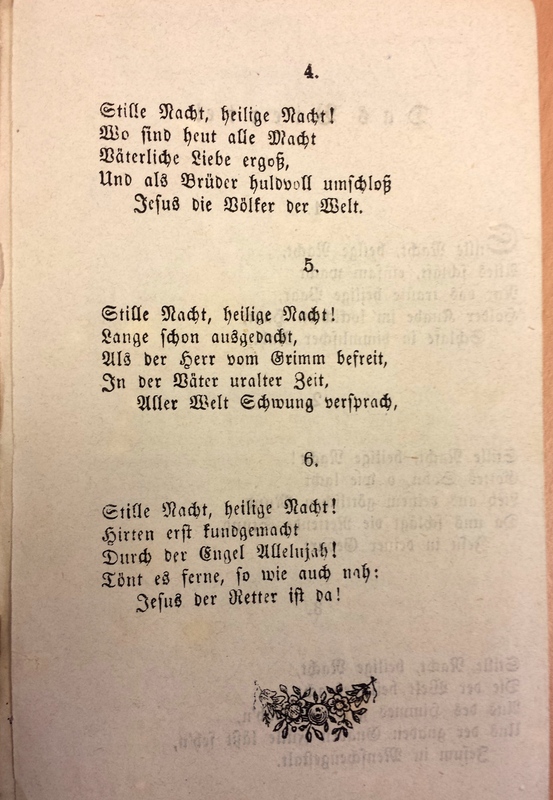 The oldest known copy of the Austrian Christmas carol Stille Nacht (Silent Night in English) has been discovered in an antique shop in Vienna. 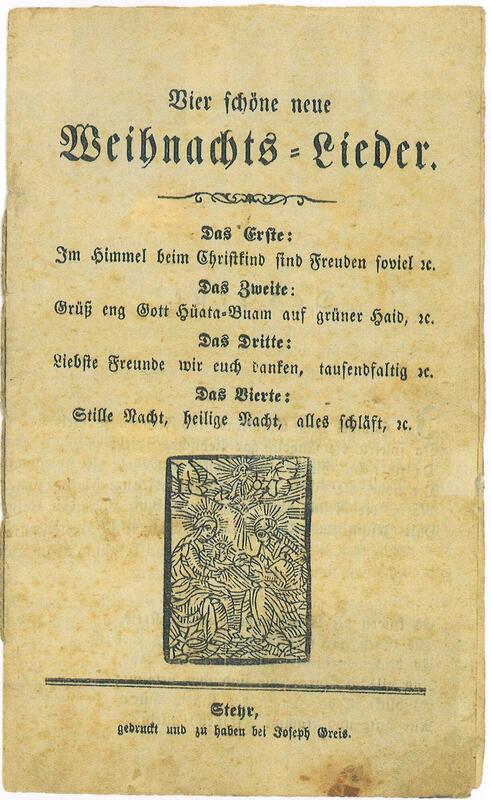 The pamphlet entitled Four Beautiful New Christmas Songs was printed by one Joseph Greis in the small Upper Austrian town of Steyr in the early 19th century. The full lyrics of Silent Night, the six original verses, are printed on pages seven and eight of the pamphlet. It was found by an antiquities dealer in June of 2015. Experts from the University of Vienna and the Silent Night Society in Salzburg examined it and confirmed it was the oldest known printed edition of the blockbuster. The song began as a poem written by Josephus Franciscus Mohr in 1816. 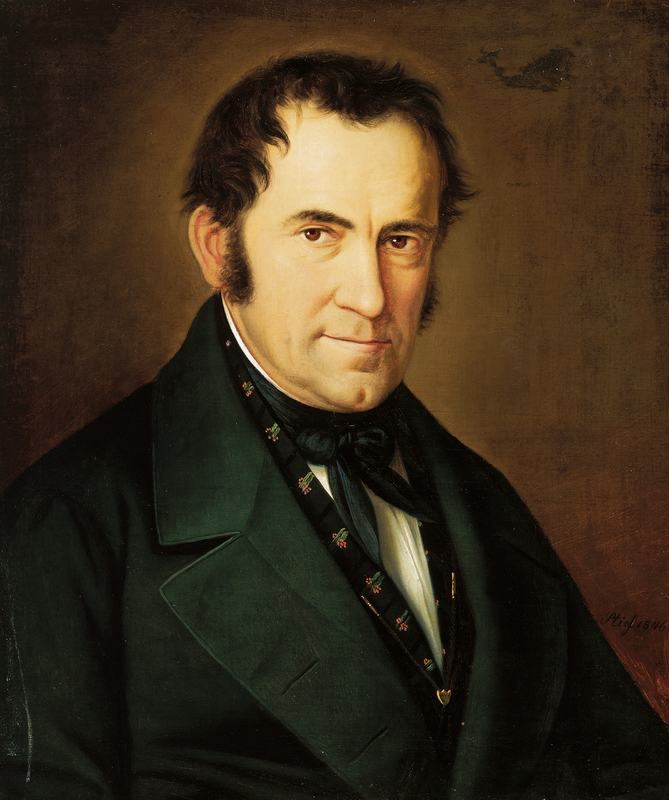 Mohr was born in Salzburg the illegitimate son of an embroiderer and an army deserter who abandoned his pregnant girlfriend before Joseph was born. The poverty of his early childhood was given a reprieve when Johann Nepomuk Hiernle, the vicar and musical director at Salzburg Cathedral, recognized the boy’s talent and sponsored his education. Mohr entered the seminary (he had to secure a special dispensation because of his illegitimate birth) and was ordained a priest in 1815. These were turbulent times. With the end of the Napoleonic wars and the new boundaries established by the Congress of Vienna, the former ecclesiastical Principality of Salzburg was divided into two sections, one given to Bavaria, the other Austria. Trade was disrupted and the associated industries — transportation, ship building, heavy lifting — suffered. Mohr witnessed this widespread economic uncertainty, political upheaval, troop withdrawals and the fallout from years of war in his first job as assistant priest at Mariapfarr in the Lungau region of Salzburg where he wrote Silent Night. It didn’t become a song until two years later. 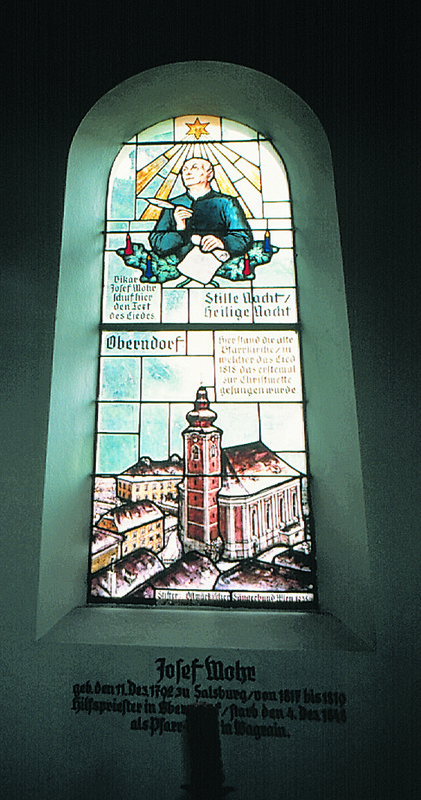 Mohr was then assistant priest at St. Nicholas Church in Oberndorf. Legend has it mice had eaten through the church organ making it impossible to play, so on Christmas Eve, 1818, Mohr gave choirmaster, organist and schoolteacher Franz Xaver Gruber his two-year-old poem and has him to write a melody suitable for two solo voices, a choir and a guitar. A few hours later, Gruber was finished and Stille Nacht was performed for the first time. Mohr played the guitar and sang the tenor role; Gruber sang bass. The parishioners loved the simple song, and very soon the rest of the world would too. Just a year later it was already being performed in Tyrol by the popular Rainer Family Singers. In 1822 they performed it in front of Emperor Franz I of Austria and Tzar Alexander I of Russia. The Rainer Singers brought the song Stateside in 1839 and performed it for the first time on American soil in front of the Alexander Hamilton Memorial in the cemetery of Trinity Church in New York City. An English translation was written in 1859 and by the turn of the century there were translations on every inhabited continent. Today Silent Night is sung in more than 300 languages and dialects all over the world. It is by far the most popular Christmas carol ever, with 733 copyrighted recordings since 1978. Bing Crosby’s 1935 version of the song is the third best-selling single of all-time. (His White Christmas is number one). Despite its almost immediate local and regional prominence, there is no original manuscript of the poem or of the composition. 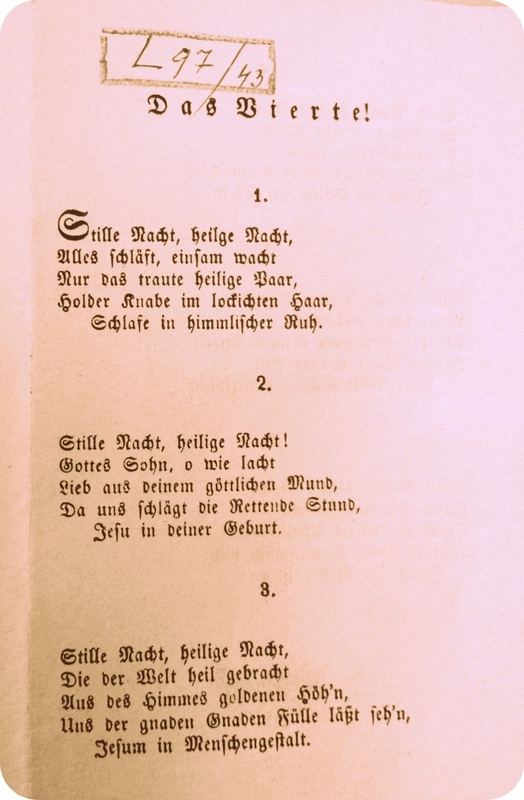 The printed version previously believed to be the oldest extant was published by A. R. Friese in Dresden in 1833, part of pamphlet entitled Four genuine Tyrolean songs. The recently discovered pamphlet is not dated, but Silent Night Society researchers believe it significantly predates the Friese publication because Joseph Greis, the publisher, ran a printing business in the early 1800s. He opened a bookstore in 1827 and died in 1835. There are no Greis printings after 1832, so even if Four Beautiful New Christmas Songs was one of the last things he did, it still beats the Dresden edition. This entry was posted on Sunday, December 18th, 2016 at 11:37 PM	and is filed under Modern(ish). You can follow any responses to this entry through the RSS 2.0 feed. You can skip to the end and leave a response. Pinging is currently not allowed. You better watch out, you better beware: Nowadays, the distribution of Christmas carols might be interpreted as heresy, conversion or possibly missionary work, for instance even in great places such as Turkey. Ἅγιος Νικόλαος from what is now southern Turkey had a reputation for secret gifts, such as putting coins in the shoes of those who left them out for him, a practice celebrated on his feast day, 6th of December. For those observing the Julian calendar the celebration takes place thirteen days later, so to speak in accordance to winter solstice, and Nick became the role model for Santa Claus. Some older characters connected to the event were turned into ‘Santa’s Helpers’. Particularly in Austria, there is the tradition of ‘Krampus’ (similar to, but not to be confused with ‘Perchten’), of which Christoph Waltz gave an account. Lovely find. The most notable fact in the article is that there IS a Stille Nacht Gesellschaft. When growing up I always thought I would hear “Stille Nacht” sung from the opposing trenches. Alas, it’s not meant to be. Merry Christmas fellow history nerds!